Let’s make one thing clear from the out-set: at no point do you actually install Office on your iPad. CloudOn hosts the apps on its server and you run them over the next in much the same say that you’d run a virtualized instance of Windows, Linux or OS X in Parallels Desktop or VMware Fusion. You might expect this to hamper performance, but it doesn’t. On a domestic broadband connection, the system feels as light and responsive as a native app. It performs automatic saves at regular intervals, too, so the chance of losing your work when the connection drops is kept to a minimum. We tested this by switching on Airplane Mode half way through editing a PowerPoint presentation. Although this sent CloudOn back to the login screen, re-enabling the net connection let us return to the presentation without losing any work. Your files are stored in the cloud, with CloudOn hooking into Google Drive, Dropbox, Box.net and SkyDrive. The benefits of saving remotely go beyond simply keeping your documents safe if you lose your iPad: CloudOn’s built-in file manager lets you email complete files or a link to their online address from inside the app, and as long as you’ve enabled the necessary permissions on your cloud account, an emailed link means colleagues can work on the same file in the same location. You can add notes to your files and track edits, not only with Word’s built-in track changes feature, but also in the file list itself, which makes it easy to monitor that has done what to your files. 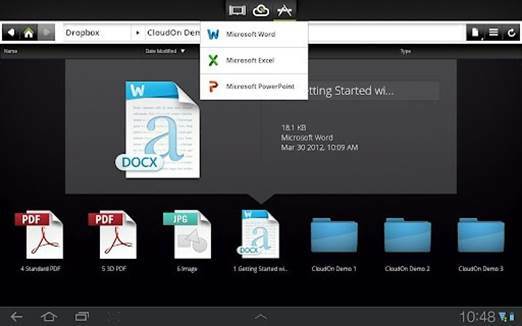 Your files are stored in the cloud, with CloudOn hooking into Google Drive, Dropbox, Box.net and SkyDrive. The keyboard, too, has an extra row of buttons that replicate the function keys at the top of a physical keyboard so you can use the native Office shortcuts. The Ctrl, Alt and Shift keys to the left of this row work in a ‘sticky’ manner, so they can be used as modifiers for other shortcuts without having to hold them down. If you’re running iOS 6 on a recent iPad (3 or later) or iPhone (4S or later), you can dictate directly into the apps. Glitches and drawbacks are few and far between. We still found it possible to call up native Windows file dialogs on the remote computer that was hosting eth suite by using common Windows shortcuts, and it threw up warnings if we tried to go any further. Tapping OK was enough to dismiss them, though. Dyed-in-the-wool Mac users may also find the Windows environment visually unfamiliar, and there’s no option to choose the Mac edition of Office. Good though CloudOn is, its biggest recommendation could well be its price. At present, it’s free, and isn’t supported by ads, with CloudOn explaining that in future the service ‘may have a tiered pricing structure’ or ‘become a time-based service’. It remains to be seen how either of these will affect its appeal, but for now, CloudOn is the best way to edit Office documents on iOS in their native format.